Eoghan Stokes scored a cracking goal as Derry City cruised into the next round of the cup. 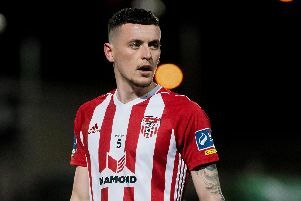 EA SPORTS Cup holders, Derry City eased through to the quarter-finals of the 2019 competition with a comfortable victory over First Division outfit, Longford Town at Brandywell. The 11 times record winners avoided an upset by the previously unbeaten Midlanders with Junior Ogedi-Uzokwe heading Derry into a 19th minute lead with his first goal for the club. Eoghan Stokes doubled the Candy Stripes' advantage with a stunning strike into the top corner seven minutes before the break. And Argentine midfielder, Gerardo Bruna made certain of Derry's progression into the next round when he steered the ball home from close range on 70 minutes. It was an understrength City side as Declan Devine made four changes from the team which defeated Sligo Rovers last Friday night. In came Gianni Seraf for his first start of the season while Gerardo Bruna and Josh Kerr were restored to the starting line-up. Jamie McDonagh returned from his four match suspension. Longford boss, Neale Fenn made sweeping changes, 11 in total from the team which started in the 2-0 win over Shelbourne at the weekend as he looks towards a difficult league trip to Wexford. As expected, the home side dominated possession in the early stages and after three minutes Stokes had the first effort on target with a 20 yard strike which sailed into the hands of Jack Menton. McDonagh found himself in space on the edge of the box and volleyed a decent strike just wide of the upright on 12 minutes. The Midlanders, winners of the 2004 competition, were threatening from set-pieces but it was Derry who tested the Longford keeper from Stokes' 30 yard free-kick but he gathered it cleanly. Ex-Leeds United man, Stokes then doubled Derry's lead seven minutes before the interval as he received a short pass from Ogedi-Ozokwe before curling a stunning strike into the top corner - his third goal of the season! Longford made an impressive start to the second half and Eoin O'Neill found himself in behind his man on 55 minutes but blasted high and wide. Substitute, Shane McNamee saw his close range strike at the near post blocked by the chest of the Longford keeper before Seraf curled an effort narrowly over the bar. Longford keeper ,Menton then saved well from Ciaron Harkin's long range strike before denying Ogedi-Uzokwe's point blank header as Derry stepped it up a gear. The third goal finally came on 70 minutes when Menton spilled Stoke's 35 yard strike and Bruna reacted quickest to steer the ball into the net at the near post. Ogedi-Uzokwe threw himself at McDonagh's inswinging corner but his effort was cleared off the line by Karl Fitzsimons. Colchester loanee, Ogedi-Uzokwe should've added a second on the night when Menton deflected McDonagh's low cross onto his head but the striker headed over from five yards in the final minutes. Substitute, Conor Gormley then flashed a strike across the face of goal and wide deep into stoppage time but it was a comfortable night for City who look towards the North West Derby against Finn Harps on Friday night. Derry City: N. Gartside; J. McDonagh, E. Toal, J. Kerr, C. Coll; J. McDonagh, G. Bruna, G. Seraf (C. Gormley 76), J. Ogedi-Uzokwe; E. Stokes; D. Parkhouse (S. McNamee 60); Subs not Used - D. Houghton, G. Sloggett, E. Tweed, A. Gilchrist, B. McNamee. Longford Town: J. Menton; K. Fitzsimons, T. Noach-Hofmann, J. Manley, K. Knight; K. Chambers, P. O'Conor, J. Hollywood, S. Brennan, E. O'Neill (P. O'Sullivan 71); J. Doyle; Subs Not Used - U. Keller, A. Breslin, P. Hopkins, A. Devlin, D. Byrne.